Experts disagree how Paris came to be known as the “City of Light.” According to the official City of Paris website, the nickname was originally bestowed upon the city “because it was a vast center of education and ideas during the Age of Enlightenment.” Other sources state Paris was dubbed City of Light in 1828 when it began lighting the Champs-Elysées with gas lamps, the first European city to do so. Still others claim the moniker came into fashion when Emperor Napoleon III tore down whole quarters of houses dating back to the Middle Ages in order to make way for large avenues that let light pour into the former Medieval city. 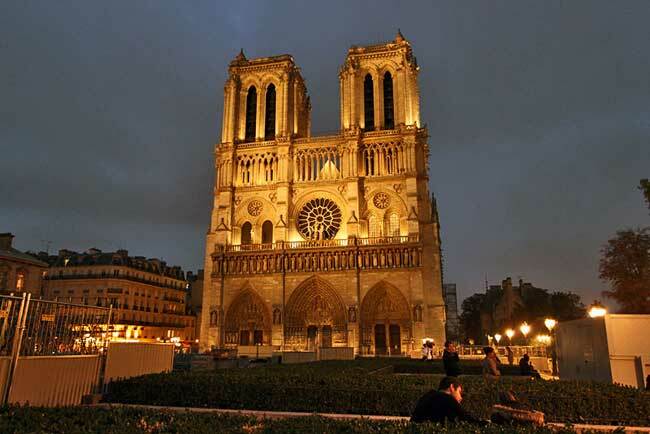 Whichever story is correct, there is no doubt that the name is apropos; today Paris has no less than 242 illuminated hotels, churches, statues, fountains and national buildings. I definitely wanted to see the city by night, but where to start? Even in broad daylight, touring a new city can be challenging, but by night it’s a daunting proposition. Fortunately, I had a home-grown tour guide. My friend Jérôme Gobin, who had recently returned to France after traveling the world for a year, was eager to show me how to get around Paris. 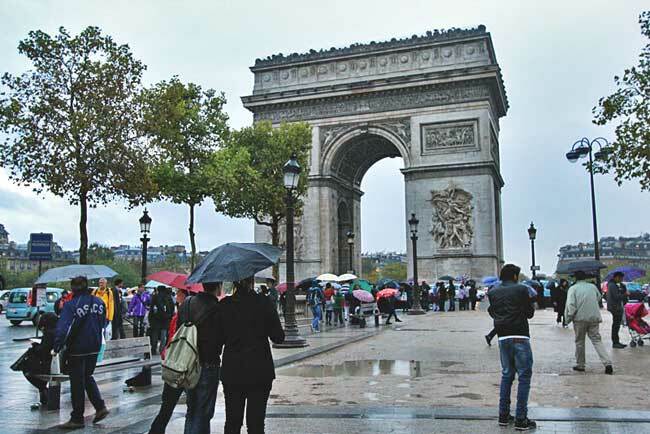 We met up at the Arc de Triomphe at dusk and ducked beneath the immense arch to shelter from the persistent drizzle (refer to #1 on the map at bottom of article). For the next several hours he treated me to a breathtaking walking tour of Paris by night, which I recreate here so others can follow our path. As darkness descended, reflections from the eternal flame of the Tomb of the Unknown Soldier flickered on the cold stone walls, engraved with names of French war victories and generals. Beyond the memorial lay the Champs Elysee (#2), Paris’ famous upscale shopping street, with storefronts representing the world’s most famous merchants. We wandered along the rain-slicked pavement, past stately horse chestnut trees, peering into the windows of Cartier, Louis Vuitton and the largest Adidas store in the world. A few blocks down, we turned right onto Winston Churchill Avenue and strolled between the Nef du Grand Palais (Great Palace) and the Petit Palais (Small Palace). Both built in 1900 for the Universal Exhibition, today they are a museum and exhibition space. At the banks of the River Seine we stepped onto the single span steel arch of Pont Alexandre III bridge (#3), considered an engineering wonder when it was built is 1900. From one end to the other it was lined with stunning art Nouveau streetlamps, cherubs, nymphs, stone urns, lions and winged horses. Below, the inky Seine was aglow with golden reflections from illuminated bridges. 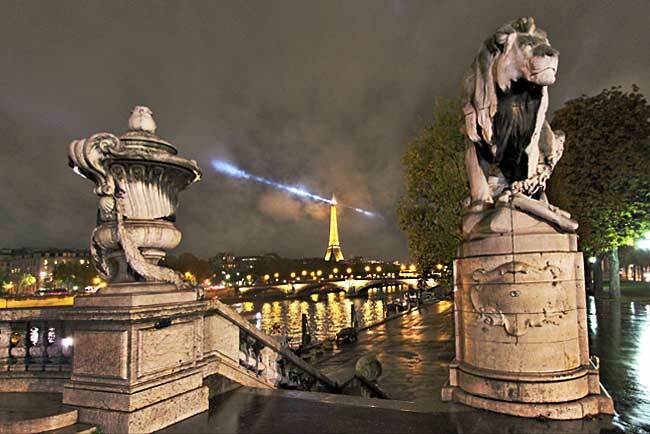 In the distance, the Eiffel Tower’s blue laser light pierced rain clouds and fog, lighting up the sky. Goosebumps raised on my arms and neck. The previous two days had been a whirlwind of arrival and settling in, but standing there on the Alexandre III Bridge I was entirely in the moment. “My God,” I thought. “I’m in Paris!” With feet that barely touched the ground, I returned to the right bank, where we continued to Place de la Concorde (#4), the largest plaza in Paris and most famous as the site where King Louis XVI, Marie Antoinette, Madame du Barry, and Maximilien Robespierre, among others, met their final fate by guillotine. Today, no evidence of the plaza’s gruesome past remains. At its center is a giant basalt obelisk, covered in ancient Egyptian hieroglyphics that date to the reign of the pharaoh Ramses II. One of only two in the world, it was donated to France by the Egyptian government in the 19th century. Bracketing the obelisk at either end of the plaza are two lovely fountains with stone basins and frolicking nymphs that spout water. 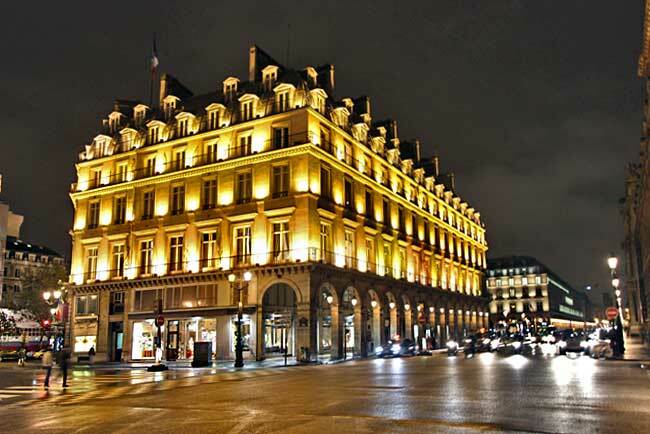 At the north end of Place de la Concorde, we turned right onto Rue de Rivoli (#5), awash in lights from upscale hotels, where doormen in top hats held doors open for guests or signaled for taxis. Several long blocks later we turned right onto Place du Carrousel and into the front entrance of the Louvre Museum (#6). A breathtaking structure any time, at night it takes on a magical quality, as soft light emanating from its famous glass pyramid imbues the entire plaza with a burnished glow. Barely at the halfway point of our walk, we picked up our pace. Just beyond the Louvre we diverted onto the Pont des Arts (#7), a pedestrian bridge over the Seine that has become a favorite of lovers, who attach padlocks to its railings and throw the key into the river as a symbol of their everlasting love. With the hour growing late we crossed over to the left bank and made our way to the Panthéon (#9), just off Rue Saint-Jacques in the Latin Quarter. 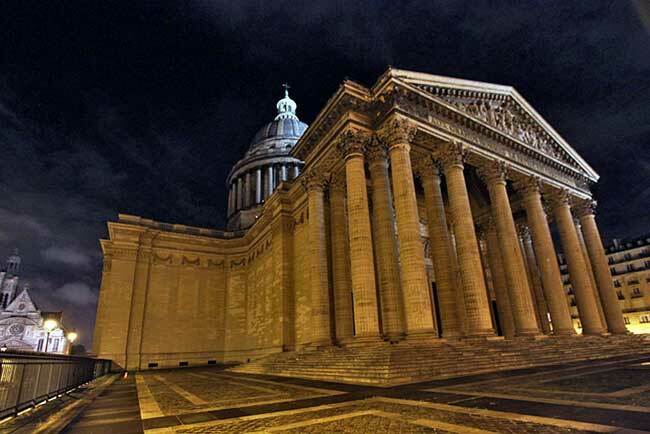 Originally built as a neoclassic church with a facade modeled after the Pantheon in Rome, today it is a crypt containing the remains of the most distinguished of French citizens, including Maria Curie, Voltaire, Victor Hugo, Émile Zola, and Jean Moulin. 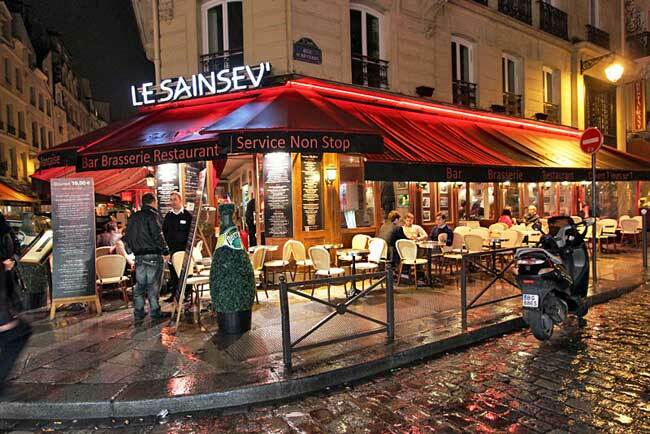 By now we were starving, so we backtracked to the Left Bank of the Seine and wandered through the Latin Quarter (#10). Though loaded with tourists, the narrow cobblestone streets are a photographer’s dream come true, with cute shops and neon-outlined cafes mingling with old churches. As the rain picked up, we ducked into a Creperie, where I scarfed down a delicious Galette filled with smoked salmon, melted cheese, and crème fraîche, and lingered over dinner until the rain abated. Finally, with full bellies and less sore feet, we headed for the Metro station at Saint-Michel (#11), pausing briefly to examine the sculpture of the saint that marks its entrance before descending into the tunnels. As I rode back to my comfortable vacation rental apartment in the 9th Arrondisement I realized I still had goosebumps. And I know, without a doubt, that if I hadn’t seen Paris by night, I wouldn’t really have seen Paris. 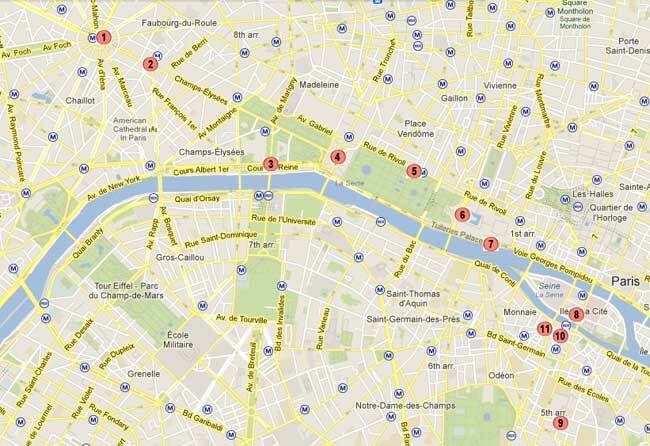 To follow the same route I took on my walking tour of Paris, match up the numbers in the narrative above to the map below. The entire trek can be done in three to four hours, not including a stop for dinner. If you wish to shorten the tour, eliminate the Panthéon. Enjoy! Thanks for the guide! This is a great help! You’re welcome Jose. Glad you found it to be helpful. Thanks for this write-up. 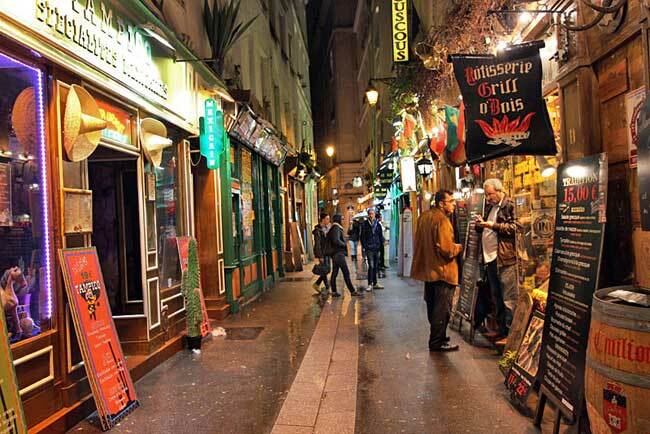 We recreated your walking tour of first night of Paris and it was amazing! Seems like the love lock bridge removed all of the locks though. It was also reinforced with glass so people can’t attach locks to it. Might have been a safety hazard. Anyway, thanks for the great post! Hi David: Thanks so much for letting me know my walking tour was helpful. That kind of feedback makes it worth all the trouble I go to with this blog. And thanks for the info about the love lock bridge. There was controversy when I wrote the article. Apparently the city had removed all the locks several times because they were worried about the weight. Each time, people protested, so the city continued to allow it. I guess they just got fed up with it. 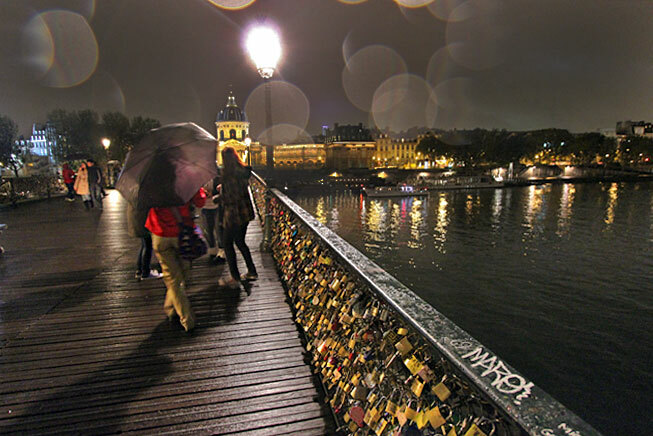 There was a time when the love lock bridge was a novelty, since it apparently started in Paris, but now I see it all over the world. Gracias por el mapa y las explicaciones! desde Arg estoy preparando mis dias en PR ire solo asique esto me es de gran ayuda! De nada, Cristian. Estoy contento de haber sido una ayuda. If i ever get back to Paris, this post is going to be a great reference. Thank you. That was my aim Rosemary – so glad you liked it! Beautiful pics and what fond memories you bring back. One of our favorite experiences was walking around Paris (many of the same places in your post) very late at night. It was clear, cold December night and very quiet. We had Paris to ourselves, it seemed! Hi Cathy: I was also there in off-season, and while I contended with rain and chilly temperatures, I thought the city so much more magical because it was virtually empty of tourists. Paris is one of my favorite European cities. Thanks Cristina! Don’t know which I love more, writing or photography! The city just never ceases to inspire and delight me. I couldn’t agree more, Talon. Paris is one of the few cities that I could return to, again and again, and never run out of things to do or grow tired of it. Sounds like a great walking tour! Paris definitely has a different feel at night. Great photos! Some ravishing night shots here, very nicely done and getting such excellent photos at night isn’t all that easy, so you’ve mastered a tricky task here. I made basically this same walk about 15 years ago but during the day. When I get back some day I’ll have to do this at night. Lovely. Hi Greg: Thanks so much! I do more and more night photography and it’s fast becoming my favorite time of day to shoot, especially in larger cities. The most beautiful night city in the world in my humble view. Lovely suggested walking tour. Thanks Mark! I could have spent six months in Paris and still not seen anything. Fabulous city! 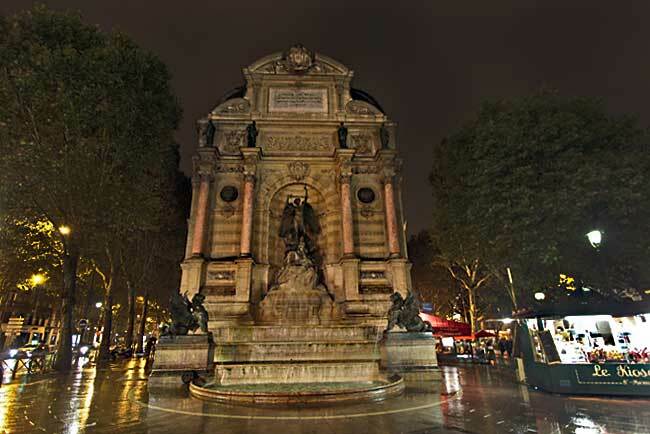 While I have visited Paris quite a few times, I haven’t done a walking tour at night. The only place we went at night was the Eiffel Tower and it was beautiful especially when they have the lights. I should definitely look into the night tour and by the way your photos look lovely. Thanks Jam. In addition to it being a lovely walk, I also felt completely safe in Paris, all hours of the night and day, whether with my Parisian friend or alone. Hope you get a chance to see Paris by night. Thank you Barbara Madam, for this great information about Paris city. Personally I feel the beauty of every place get increased in the night in the colorful sparkling lights. 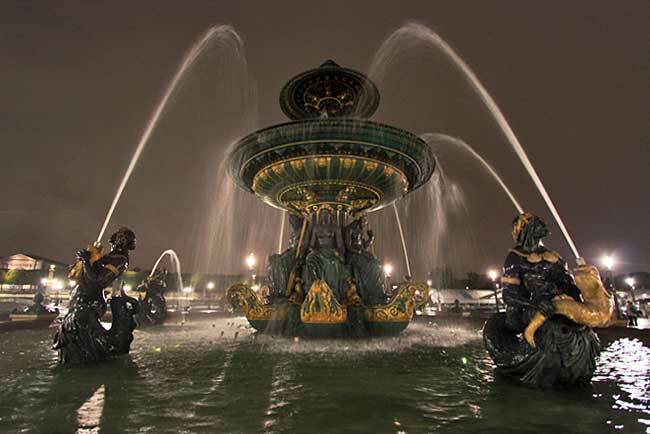 In Paris it is really a nice experience to watch many fountains, monuments and Eiffel Tower in night. From your photos I love the light decoration of An illuminated building. 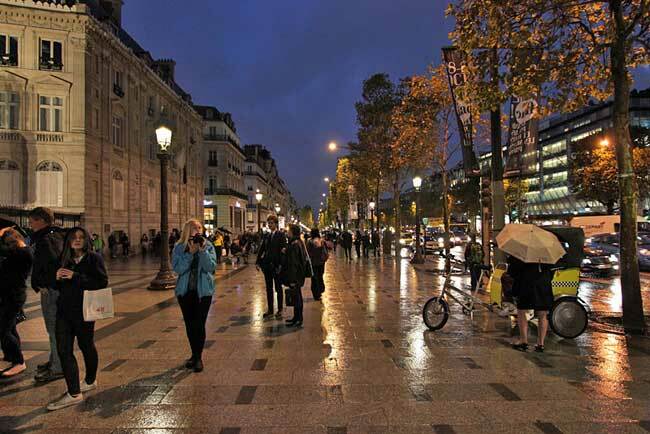 I love walking through Paris at night…you were so lucky to have a personal tour guide to show you around. 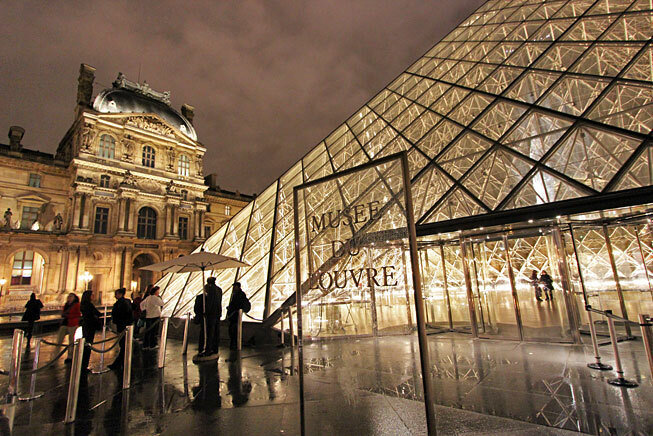 Love your photo of the Louvre – it photographs so beautifully at night. 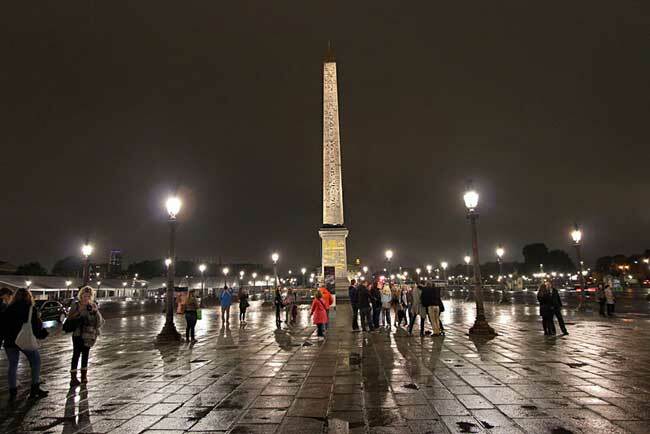 Whatever the origin of the name “City of Lights” – I can’t get enough! Me neither, Anita. Can’t wait to go back. Even with two weeks, there was so much I didn’t get to see. Hi Jerome: I’ll definitely be back at some point and will let you know. You were a wonderful tour guide and I had so much fun! Thanks Laura Lee – glad you enjoyed it! Thank you for this post! We were in Paris about 6 months ago but only had 4 days there which was no where near enough time. And, we didn’t go out a lot at night. Now I feel like we missed out on so much by not doing a walking tour at night! From your photos, it looks beautiful. We will be back in Paris later this year or next so we will bookmark this post so we can follow your footsteps! Thanks again for a great post! Brilliant update. Very descriptive with great photos. Paris truly is magical at night. Can never be bored or not inspired wandering the streets there at night. Thanks Paul! I absolutely agree, Paris at night was almost sensory overload for me. I feel that any city shows its true colors & comes alive at night. Paris is no different. The city of love definitely glows in the darkness of the night. Gorgeous photos. I love Paris and can’t wait to go back! Thank you for sharing these gorgeous photos! I haven’t been to Paris in 20 years, but it’s one of the most beautiful cities I’ve ever visited. Thanks for the memories! So glad I could bring back those old memories, Diane, and thanks or your comment. This is a must-do, for sure! Beautiful photos! Nice post and pictures. Your tour map is very helpful for our planning. Thanks! You’re very welcome – so glad it will help with your visit. Fantastic Jessica – glad my post will be helpful.